Megalodon performed at JazzPA's 2009 Summer Jazz Celebration, and the Daily Collegian spoke with me about our group, and the proliferation of one of America's most original art forms. The annual festival hopes to keep jazz accessible, and to attract younger listeners to this great American music. Charlie Heim (graduate-music education), a performer and co-founder of the band Megalodon, said free concerts like the Summer Jazz Celebration are great things for locals to support and people are always going to want to listen to live music no matter what the economic situation is. Heim and his friend Greg Johnson started the band. ...Heim said studying and working with jazz music for a long time has made the genre his “main drive in music” for a while. 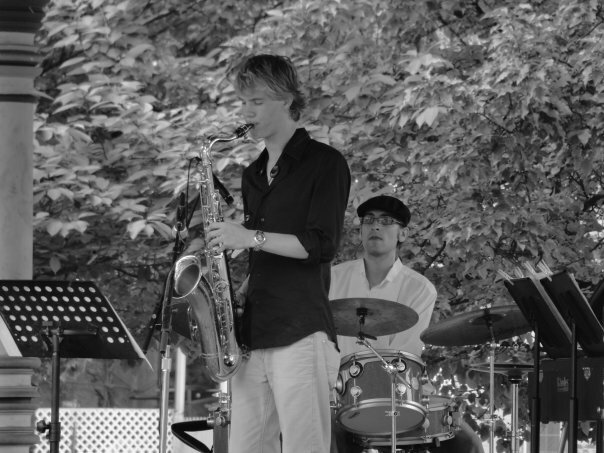 He added that even as a college-age musician, the energy jazz provides, along with the technical and musical challenge, is what appeals to him the most. The band Heim will perform with on Saturday attempts to link jazz, rock and pop, even though Megalodon is not necessarily a “fusion” band. Megalodon just recently played at the Central Pennsylvania Festival of the Arts, and Heim said he hopes that the performance at the JazzPA festival will also make his music available to a diverse audience.